Bandaranaike International Airport serves six million passengers a year. 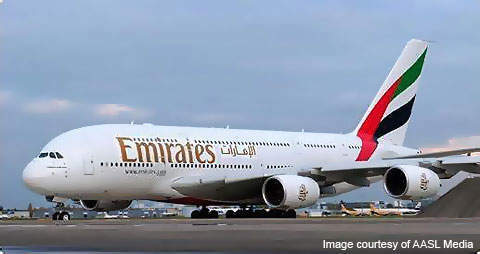 The Emirates Airlines Airbus A380 (superjumbo) aircraft uses the airport as an emergency / medical alternative. 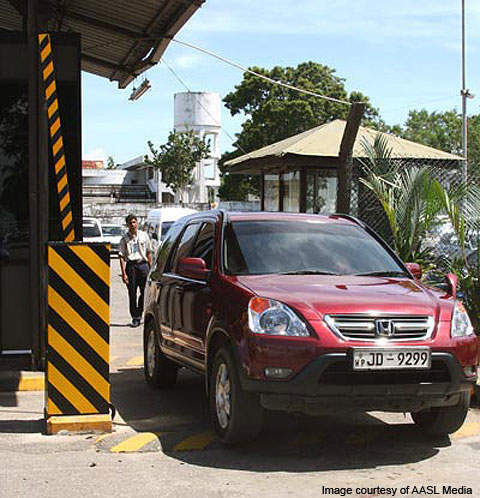 A vehicle going through the automatic entry system at the airport. The 35m control tower covers a radius of 10nm. A train service was launched between BIA and Colombo Secretariat Station in June 2010. Bandaranaike International Airport (BIA), also known as Katunayake International Airport or Colombo International Airport, is located in the town of Katunayake to the north of Colombo. Serving six million passengers a year, it acts as a hub for Sri Lankan Airlines and serves British Airways, AirAsia, Indian Airlines, Condor, Qatar Airways, Cathay Pacific Airways, Emirates and Jet Airways. 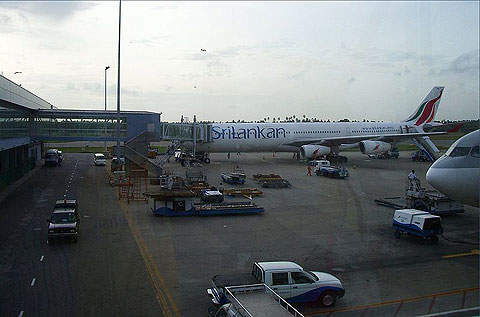 BIA is the first international airport in Sri Lanka and is operated by Airport and Aviation Services Limited (AASL). Construction began in 1964 and was completed in 1967. BIA replaced Ratmalana Airport as the country’s international airport, and is certified by the Civil Aviation Authority (CAA) of Sri Lanka. The airport has been a popular cargo port for a many years, in the past serving Lufthansa, Emirates and China Airlines. It also served Trans World Airlines (TWA) for a short time. At present, MidEx Airlines is the active freight carrier. The airport is also fully equipped to handle the Boeing 747-400 mega-top aircraft. BIA was a base for the UK’s Royal Air Force during World War II, and was handed over to the Royal Ceylon Air Force in 1957. 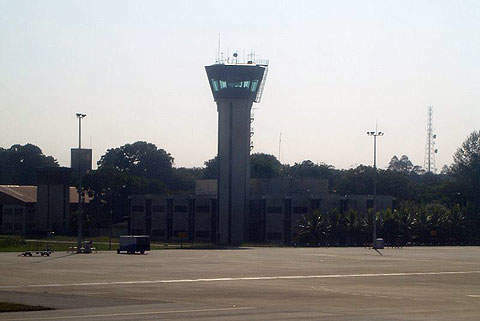 It was later renamed as Katunayake International Airport. BIA handled 9.2 million passenger movements, 65,608 of aircraft movements and 254,269t of cargo in 2015. The expansion of BIA is being carried out in two phases. Construction work under Phase I began in 1987 and finished in 2000. The work carried out included the construction of a runway, taxiways (A, B, C, D and E) and aprons (A, B and maintenance). "A second runway is planned to be built at Bandaranaike International Airport to support the Airbus A380." Stage one of Phase II began in 2001 and included the overlay of the taxiway, expansion of the apron (60,800m²), improvement of the apron (9,400m²), construction of the sewage treatment plant and cargo terminal building (13,000m²), setting up of the secondary surveillance radar, and RDP and ATC consoles for approach control, weather observation and displays. Stage two began in 2013 and includes the construction of new apron with nine aircraft stands, new taxiways, passenger terminal for both arrivals and departures, renovation of existing passenger building, eight boarding gates, and the extension of railway line up to the cargo centre. The construction is expected to be completed by 2019, enabling the BIA to handle 12 million passengers a year. The BIA has three cargo terminals and one passenger terminal. The arrival and departure areas in the passenger terminal are located close to each other, easing the movement of passengers between terminals. The passenger terminal features 39 check-in desks, four gates, 575 short-term parking spaces, three airport hotels, restaurants, cafeterias, bars, a VIP lounge, duty-free shop and disabled access / facilities. In 2009, a lounge named Silk Route was opened at the terminal, providing amenities such as food, newspapers and internet access. A newly reconstructed VVIP lounge was opened in 2013. The cargo village Terminal 1 occupies a 2,787m² area and includes freight forwarders, warehouses, airline offices, banks, courier service, gem and diamond exchange and customs. The 1,858m² cargo village Terminal 2 has facilities for refrigerated and frozen cargo, airmail sorting centre and offshore avionics workshop. The Bandaranaike international airport has a single runway (04/22) with asphalt surface. The take-off and landing distances of the runway are 3,441m and 3,350m respectively. The overall length of the runway is 91m. There is a plan to construct a second runway to support the Airbus A380. AASL signed an agreement with a joint venture between China National Aero Technology International Group (CATIC) and Shanghai New Era Airport Design and Research Company for the resurfacing of the runway, in September 2016. Construction began with the ground breaking ceremony held in January 2017. The BIA’s air traffic control system features a control tower and an approach radar control centre. The 35m control tower covers a radius of 10nm from the airport and can control aircraft in the air to a maximum altitude of 4,000ft. BIA is equipped with mono-pulse secondary surveillance radar (MSSR) equipment to provide improved air traffic control. The airport comprises two open-air parking areas, terminal parking and remote parking. The terminal car park has the capacity to accommodate 400 cars and vans. The remote parking area, located 300m away from the terminal, is larger. It accommodates motorcycles, buses, lorries and three-wheel vehicles. "Phase II works include the construction of a pier with two-levels of airbridges, a taxiway and a 104,000m² passenger terminal building." 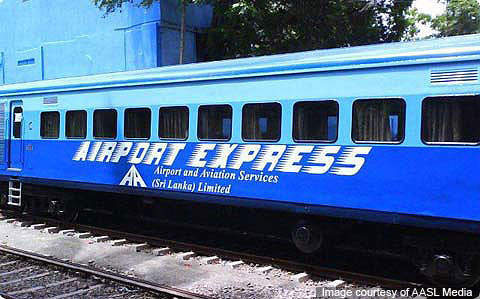 In June 2010, as a part of Airport & Aviation Development Program, a train service was launched between BIA and Colombo Secretariat Station. The airport was built by the Taisei-Mitsubishi joint venture. Maga Engineering developed the existing cargo building, and the new terminal building contract was awarded to Japan Airport Consultants (JAC). On 4 December 1974, Martinair Flight 138 crash-landed, killing 191 passengers. On 3 May 1986, Air Lanka Flight 512, which had to fly to the Maldives, exploded killing 14 people. On July 24, 2001, the airport was attacked by Liberation Tigers of Tamil Eelam (LTTE) Black Tigers who destroyed eight military aircraft and two Airbus aircraft. Seven government personnel were killed. On March 25, 2007, the LTTE bombed Sri Lanka Air Force base, killing three personnel and injuring 16.